Following are four great resources that can assist you in writing your family history. A great book to set you on your course is You Can Write Your Family History, by Sharon DeBartolo Carmack. One of the questions I struggle with the most is answered in this book: How much research is enough? Sharon also defines the various types of family histories and provides creative strategies for the writing process. This book can be purchased on Amazon for under $20. 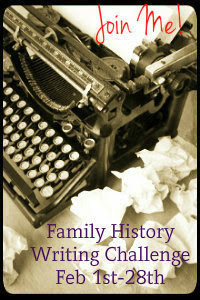 Patricia Law Hatcher gets into the nitty-gritty of writing and publishing a book in Producing a Quality Family History. While Patricia does discuss the writing aspect, the most valuable piece of her book is the several chapter dedicated to putting the book together in terms of what elements to include, the layout and design of the book, and publishing considerations. I’m glad I got this book awhile ago since it appears to be out of print; it’s certainly worth checking to see if your local library or genealogical society has a copy. Lisa Alzo did a great webinar in June called Ready, Set, Write! Share Your Family’s Story. The webinar was done through Legacy Family Tree. Lisa’s presentation was very informative and extremely inspirational. A 13 minute preview is available here. You can also purchase the CD from this link as well; it’s worth the $9.95 price tag! For All Time: A Complete Guide to Writing Your Family History, by Charley Kempthorne takes a different approach than the previously mentioned books. Charley really focuses on the writing and shows you how to make the story interesting. He gives a lot of examples and even has small challenges throughout the book to put what you’ve learned into practice. There are also chapters on the types of family histories and publishing. This book can be purchased on Amazon for under $15. Thanks for these recommendations. I've seen the first but not the other three. I'll take a look. For me, it's the question of whether to compile blog posts (by family) into a book and call it a history or to write something separate. Of course with blog posts, it would be important to edit them so there's a sequence and write enough to cover everything I wanted to for an individual or family group. Thanks for the prompt to think about this a little more. Julie is a genealogist who specializes in writing, editing, and graphic design. If you are looking for someone to help organize your family data into a book or prepare a research article for publication, Julie can help. Other services include the development of educational materials such as books/booklets, articles, and online courses. See About Julie and Services for additional information.